If you are visiting or staying in Cairns, capital of Northern Queensland, Australia, it would be a sacrilege not to visit Cape Tribulation. 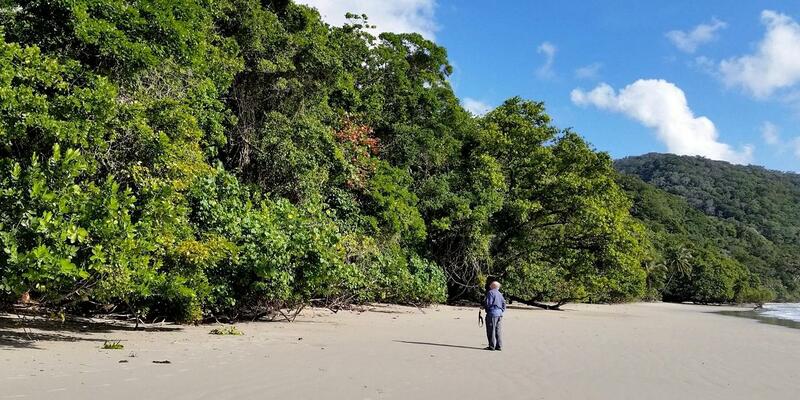 Located 110 km north of Cairns and within the Daintree National Park Wet Tropics World Heritage area, Cape Tribulation is an area well worth discovering. 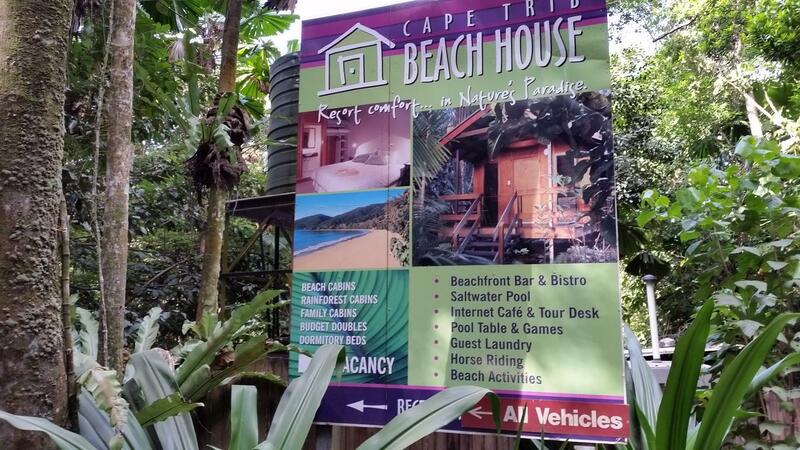 Below a few tips on what to do and where to stay in Cape Tribulation. Locally owned and operated Active Tropics Explorer tour is a smart way to experience all the highlights along the East Coast north of Cairns, all the way up to Cape Tribulation: the only place in the world were two UNESCO World Heritage areas overlap – the Daintree Rainforest and the Great Barrier Reef Marine Park. 7.30am: Active Tropics Explorer minibus driver Ben picks us up at our YHA Cairns accommodation. Having spent three years up north, Ben knows every beach, bay, and wildlife of course. As we drive along the highway, he explains us how harvesting sugar – the region’s main industry, with tourism second – used to be a hard and dangerous job, not just because of the hot and humid climate, but because of snake bites at a time before rescue helicopters and hospitals with anti-poison. On our right we watch a mob of wild wallabies taking in the morning light. First stop en route is the Mossman Gorge, where we circle for our Indigenous “Welcome to Country” smoke ceremony, performed by a Kuku Yalanji elder (though he looked rather young to us). The elder makes us and about 50 other backpacking travellers walk around a small fire with lots of smoke, then demonstrates didgeridoo breathing techniques, “soap” leaves and ocher colours. 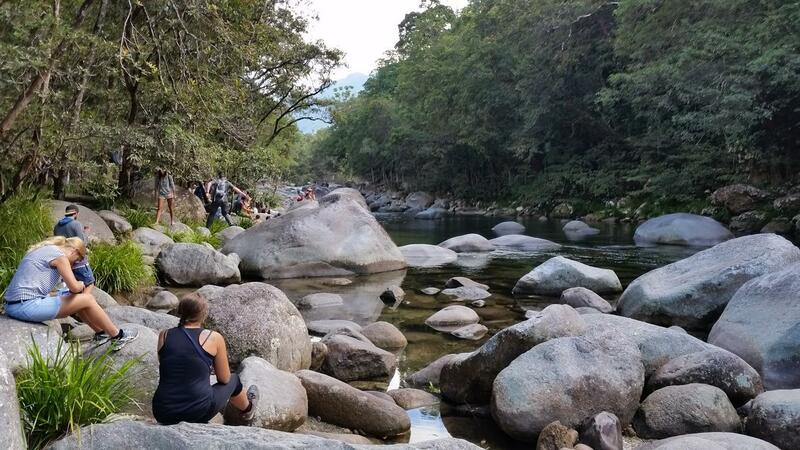 A quick stroll around Mossman Gorge concludes the experience. 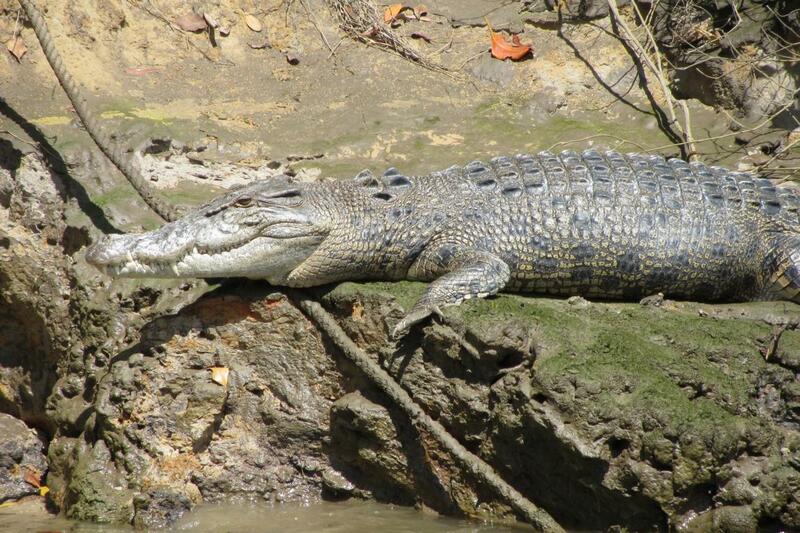 Next stop is a crocodile river cruise, where we can see some crocs on the river edge. Our guide explains that the first crocodiles appeared 240 million years ago, at the same time with the dinosaurs (with which they are related). He also warns us that crocs are very intelligent and the only living animal that actively hunt humans (so long as it doesn’t involve too much effort). With the river cruise, we cross the Daintree river and keep driving along a narrow road, full of dense forest. First signs about Cassowaries appear, warning us to watch out for those endangered, flightless birds, many of which are hit by cars. Early afternoon we reach Cape Trib Beach House, our accommodation for 3 nights, after which Active Tropics Explorer will pick us up again for the journey back to Cairns. Cape Trib Beach House YHA’s very remote location means that sustainability is high on the agenda, albeit limited to whatever is possible in the tropical environment. While our room is very budget-basic and in need of refurbishing, some of the other huts offer more comfort at slightly higher prices. 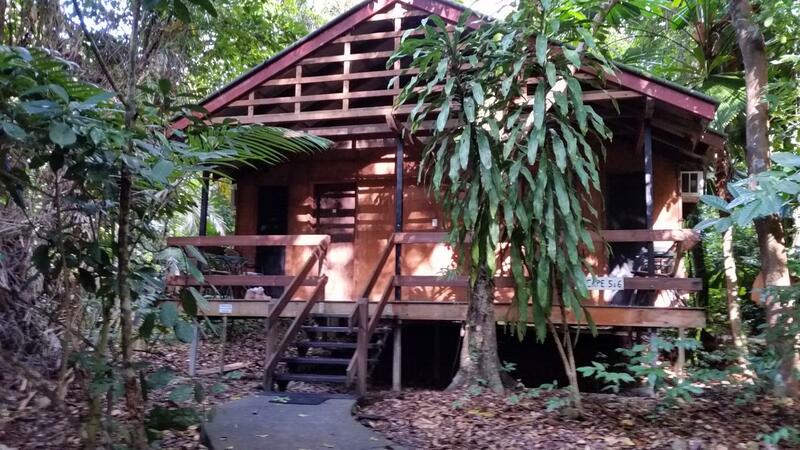 Its location smack in the middle of magical Daintree Rainforest and near the beach is what make Cape Trib Beach House an unforgettable experience. Sipping on your wine or beer while watching the rainforest from the open plan restaurant deck and listening to its weird and wonderful noises is priceless. Dominated by fish meals and evergreens like calamari rings, the menu is still surprisingly varied, considering the remote location, and includes budget deals for backpackers. Fire at the beach from 8pm is one of the unique features of Beach House YHA, and your chance to chat with fellow travellers from all walks of life. 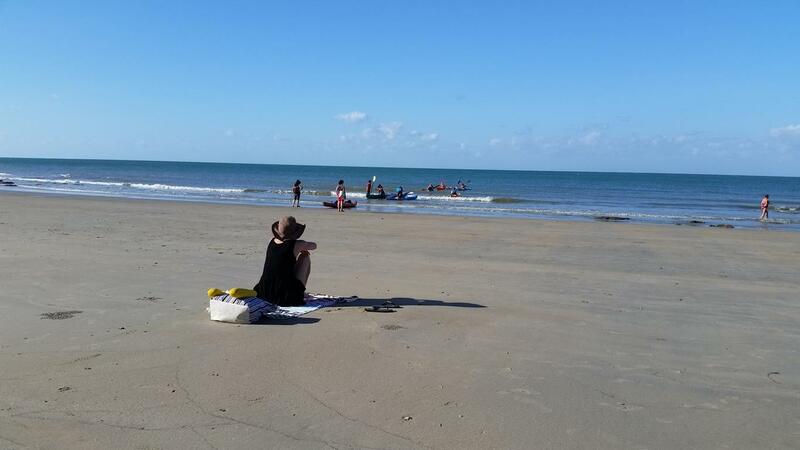 One top activity that we would recommend while visiting Cape Tribulation is sea kayaking. The family friendly tours leave right from the Beach House YHA (whose name hints at its beach location..), which makes this a convenient option even for those only staying one night. Weather conditions at sea vary, of course, which makes the level of difficulty unpredictable. Expect to get wet (part of the fun) and to spot wildlife like – on our tour – reef sharks and a few turtles. If conditions are too harsh, the tour adapts and instead of taking you around the cliffs to another bay, your guide will show you around calmer waters, near the mangroves. Half time, we park our kayaks and go for a short bushwalk to a neighbouring beach, where we are treated to chocolate cake and refreshment drink. Quick walk back to the kayaks and with the wind in our back, it is an easy paddle back to the Beach House. All in all the tour took us about 3.5 hours. What to bring: sun screen (sun in Australia is merciless), hat, sunglasses, swimwear (you are very likely to get wet), and water bottle. 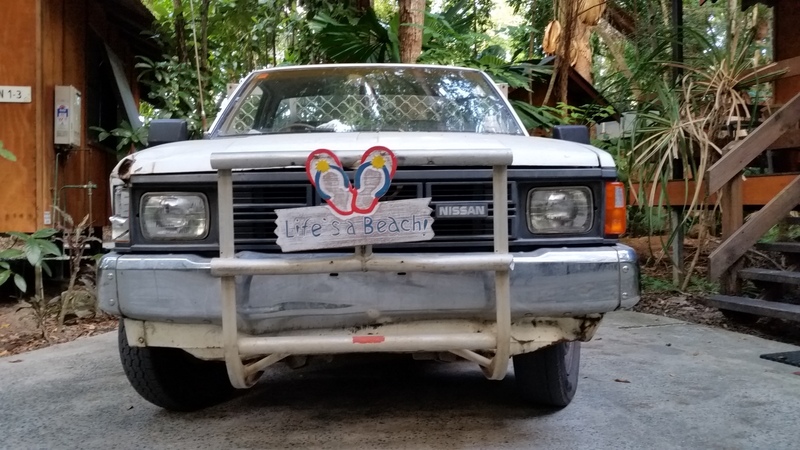 The friendly Paddletrek crew will pick you up from any accommodation within Cape Tribulation. All equipment, including life jackets, stinger suits and dry bags, are included. More info here. Ocean Safari is a great way to catch a glimpse of the colourful sealife, swim with turtles and to snorkel the Great Barrier Reef. Those tours are popular, so make sure to book in advance. Horse riding and night tours are also on offer, giving you a chance to experience the Daintree rainforest from another angle. Ask your receptionist for details and latest deals. After three nights at the Cape Trib Beach House, the Active Tropics Explorer bus collects us just after lunch for our tour back to Cairns. On the way we enjoy our ferry ride over “crocodile” Daintree river and stop for a guided bush walk, then taste some of the most delicious ice cream ever (Floravilla has over 26 flavours to choose from). More about eco-tourism certified Active Tropics Explorer tour here. 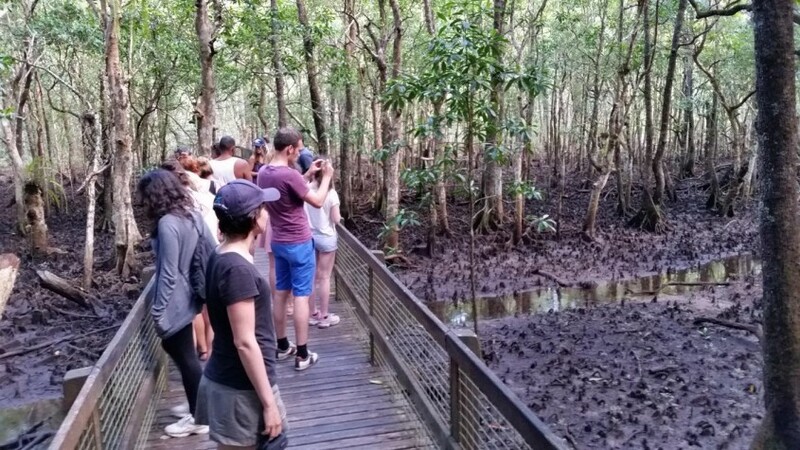 Like our tips for a great Cairns city escape, exploring Cape Tribulation and the Daintree National Park in Tropical Northern Queensland, Australia? Share and spread the word!